The USWNT will face off against Australia on April 7th, 2019 at Banc of California Stadium in Los Angeles, California. Kick-off is set for 9pm EST and VAVEL USA will be providing live updates of the game. Thank you for tuning into today's LIVE of USA v Belgium. This is Bianca Verar signing off! 73' - USA SUBSTITUTION: Mewis out, Zerboni in. 60' - USA SUBSTITUTION: Horan, Pugh out. Long, McDonald in. 46' - Second half starts! Lineups and anthems are done! Kick off coming soon. As we come closer to lineups and anthems, it should be noted for pre-game the USWNT will be wearing the names of young inspirational female athletes on their backs. The substitutes for the US are as follows: Harris, Sonnett, Sullivan, Dahlkemper, Morgan, Heath, Long, Zerboni, McDonald. Midfielder Carli Lloyd will wear the captain's band today, and we see Los Angeles local Christen Press with the start while Alex Morgan will be available from the bench. The US lineup features defender Ali Krieger, who has been recently called up after being out of the mix for awhile. Today marks Krieger's 99th appearance for the US, just one shy of reaching 100. Belgium Starting XI: Evrard; Philtjens, Jaques, Neve, Deloose; De Caigny, Biesmans, Missipo; Wullaert, Cayman, Velde. USA Starting XI: Naeher; Krieger, Sauerbrunn, Ertz, Davidson; Horan, Mewis, Dunn; Pugh, Lloyd, Press. Welcome back to our LIVE for USA vs Belgium! We're set to start in less than one hour! There is plenty ahead for the US vs Belgium. Make sure you’re still following along here on VAVEL USA for the latest updates and live commentary for the match. The USWNT will be playing in the Banc of California Stadium, home of MLS side’s Los Angeles FC. This will be the first time the US plays in the stadium, as they previously played their Los Angeles matches at the StubHub Center, home of the LA Galaxy. Today’s game will be a homecoming of sorts for hometown heroes Alex Morgan and Christen Press. Press and Morgan are well celebrated in Los Angeles and today’s match will be no exception, especially as they prepare for the World Cup. Injuries have kept people constantly in and out of rotation, but as crunch time approaches Ellis will have to make some finalized decisions to ensure the best 23-player roster to take to France this summer. In order to win another World Cup, Ellis will need a solid group of healthy players who can get the job done. All eyes are on the USWNT’s defense now. They’ve struggled to find a core starting back four, rotating many players through various positions over the past few years. Now, as we are only a few months away from the World Cup, and head coach Jill Ellis still seems to be experimenting with a starting lineup, and even a solid roster. Belgium is a first time opponent for the US. Ranked 54th, Belgium did not qualify for this year’s World Cup. They finished second in their qualifying tournament and eventually fell to Switzerland in playoffs based on away goals. Today’s game in Los Angeles is the final match before the USWNT embarks on their three game send-off series before they attempt to claim back-to-back World Cup titles. There also will be a special halftime ceremony as they commemorate the 20th anniversary of the 1999 Women’s World Cup where the US earned their first star. This is the second friendly the US will play in a week, coming off of a high scoring 5-3 victory over Australia. 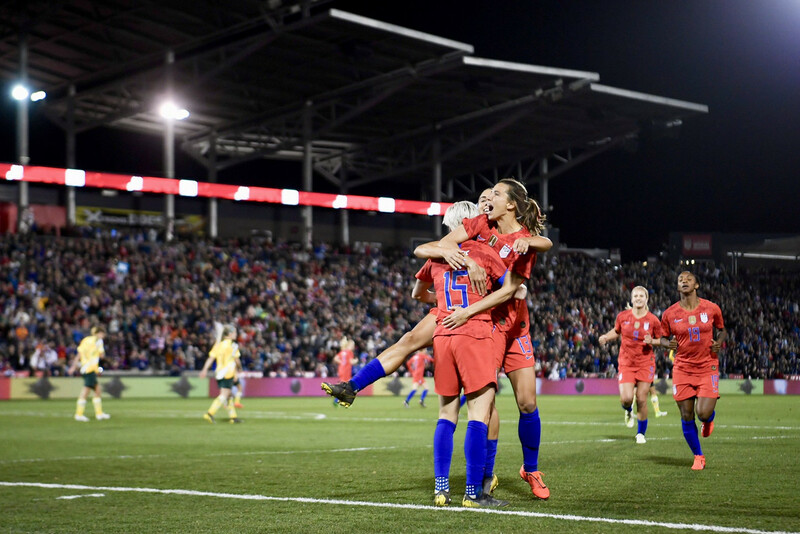 It was an eventful night for the USWNT: forward Alex Morgan scored her 100th international goal and Colorado native Mallory Pugh found the back of the net not once but twice in front of her sold out home crowd. Although they US were able to come away victorious, there are still questions about their backline and how solid they’ll be when it comes time to play in France this summer. Welcome to VAVEL USA’s LIVE coverage of the 2019 international match between the US Women’s National Team and Belgium. My name is Bianca Verar and I’ll be your host for this game. We will provide you with pre-game analysis, roster updates, and news as it happens here on VAVEL. This game will be broadcasted on ESPN 2.